Creating tax free income is essential to creating a "tax balanced" portfolio of assets that will provide you with tax efficient income to support your retirement. The U.S. Deficit is over $21 trillion and rising. What direction do you think tax rates will go in the next 20 years? We help retirees increase their after-tax income, hedge against rising tax rates and leave a tax-free legacy to heirs. We help business owners create massive tax-free income streams for retirement. We help individuals and families preparing for retirement by developing strategies to hedge against rising tax rates and diminishing returns on assets. 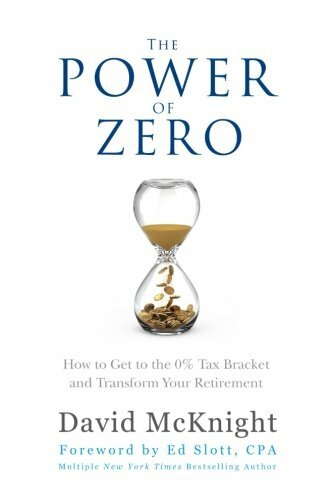 If you want to prepare yourself for rising tax rates and protect your retirement we highly recommend you read The Power of Zero by David McKnight. This book is a simple & powerful read that has positively changed the course of retirement for many. We provide complimentary copies to those who choose to explore our services in our office. You may have heard of a Roth IRA before. It's not just a myth that earnings generated from investments inside a Roth IRA can be tax free when used correctly. Many people believe they can't utilize a Roth IRA, but yearly contributions are not the only way to fund a Roth IRA, Roth conversions can also be a powerful tool allowing you to leverage current retirement assets from 401(k)s, pensions and IRAs to create tax free income when you are retired. It doesn't stop there, Roth IRAs offer other structural benefits such as no Required Minimum Distributions when you turn 70 1/2. Want to know more about how to utilize these tools to generate tax free income and balance your retirement portfolio? Click the link below. Did you know that you can take personal loans from the cash value of your life insurance policy, all while keeping the gain in the policy tax deferred? As long as you follow the IRS rules this can be another powerful and strategic way to access assets during retirement without a hefty tax bill. Once considered a strategy only used by the "uber wealthy", you may be able to utilize strategies like this to balance your portfolio and create a more tax efficient income stream. While not necessarily a tax free strategy, choosing which investments to allocate in each of your retirement and investment accounts is extremely important and commonly ignored. Some investments pay dividends, some have built in capital gain distributions and others are held for years. You may be able to reduce your tax liability and balance your long term plan with the strategic placement of your assets, which include your stocks, bonds, real estate, cash and insurance.